Using this clip as an analogy, Florida International’s defense is Ryan Atwood and their offense is Marissa Cooper. On the one hand, you have the defense carrying the offense to four wins (three more than they had in 2013). On the other hand, the Panther offense prevented the defense from achieving its potential by being a 5-ton anvil. 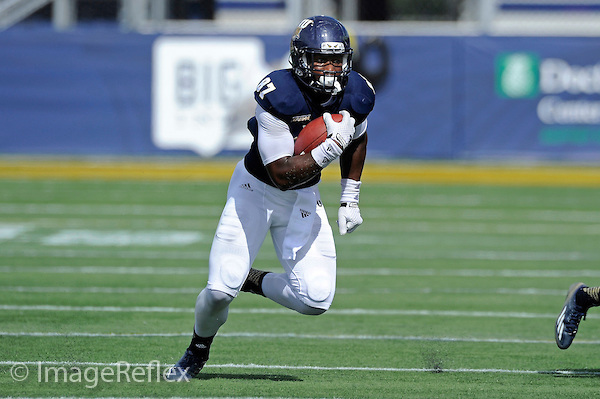 13 September 2014: FIU tight end Jonnu Smith (87) cuts through the Pitt secondary in the fourth quarter as the University of Pittsburgh Panthers defeated the FIU Golden Panthers, 42-25, at FIU Stadium in Miami, Florida. I’ve already mentioned how bad the offense was last year, so let’s try to be quasi-positive for the next few words. Jonnu Smith is the best tight end in the conference and should be an excellent target and safety valve for a young quarterback. Alex McGough was not good last year, but after starting as a true freshman there should be legitimate hope for improvement. McGough barely completed 50% of his passes and had as many turnovers as touchdown passes. The good news is he doesn’t have to be great for the team to win more, he just needs to be a game manager. Alex Gardner and Anthon Samuel both topped 500 yards on the ground last year, and managed to protect the ball fairly well as they only lost one fumble between the two of them. For a young quarterback, if these two can provide a decent threat in the running game it should take some pressure off of the passing game. Both were also decently efficient as both had four or more yards per carry. The offensive line is retooling this season, but there are a few experienced pieces to ease that process. Jordan Budwig and Aaron Nielsen were both starters last season at left guard and right tackle, respectively. Budwig is particularly experienced with 24 career starts. The rest of this line will be a fresh face with the excessive of Diegout Joseph, who wasn’t the full time starter at left tackle, but does have ten career starts. 14 September 2013: FIU defensive end Michael Wakefield (55) pursues the ball carrier in the second half as the Bethune-Cookman Wildcats defeated the FIU Golden Panthers, 34-13, at FIU Stadium in Miami, Florida. 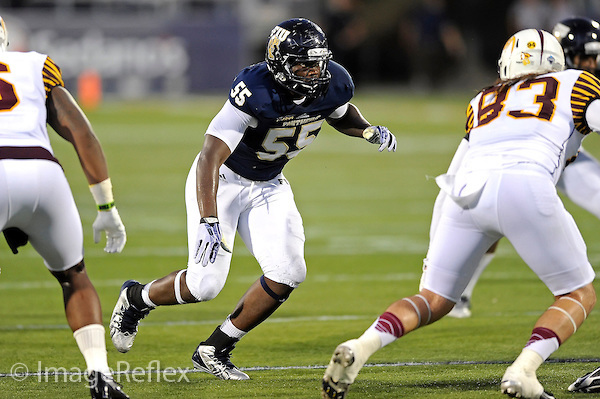 Ok no more trying to be positive, it’s almost impossible not to be optimistic when discussing the FIU defense. The most difficult thing is deciding which group deserves the most praise. Defensive ends Michael Wakefield and Denzell Perine were nightmares for opposing offenses last season. Their overall tackle numbers aren’t necessarily impressive but after combining for 24 tackles for loss and 14.5 sacks it’s safe to say that they did their job. No one really stood out at linebacker for the Panthers last season, but with the whole group returning it should continue be a solid unit. All in all, there are seven linebackers who saw the field last season, and every single one of them returns. Treyvon Williams is the leading returning tackler for the whole defense, and Davison Colimon intercepted a pass and recorded four sacks last season. The defensive backfield is facing the most turnover with both starting safeties gone, but when you return a corner like Richard Leonard it makes replacing safeties much more palatable. Leonard is the top cover corner in the conference, and showed it last season by picking off five passes. It also doesn’t hurt to have a guy like Jordan Davis stepping into a full-time role at safety after seeing action in every game last season. 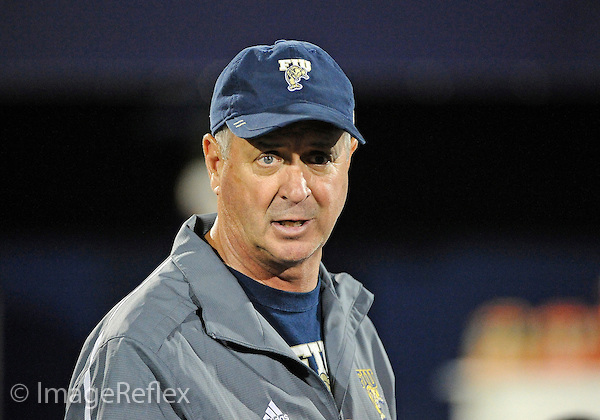 Florida International University football Head Coach Ron Turner during the Spring Scrimmage on March 29, 2013, at Miami, Florida. Ron Turner is doing a much better job at this program than the record might indicate. Turner doesn’t have the greatest rap sheet in the world, but he did go to a Super Bowl as the offensive coordinator of the Chicago Bears. All in all, the schedule isn’t too bad, either. The bad news is that the Panthers only have five home games, but the good news is that all of them are highly winnable with the exception of the season finale against Western Kentucky. So, if FIU can steal a few road games then bowl eligibility should be within their grasp, but in the end I think they fall just short. However, if the Panthers can say they’ve increased their win totals every season under Ron Turner, then that’s trending in the right direction and bowl games shouldn’t be too far away.